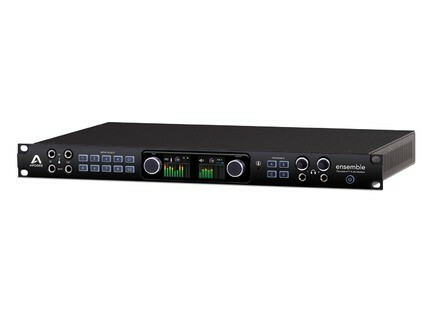 Ensemble (2014), Thunderbolt audio interface from Apogee in the Ensemble series. At $2495, the new Ensemble is no impulse purchase, but it brings Apogee quality to the growing field of Thunderbold interfaces, offering 8 mic pres, front-panel guitar I/O with reamping outputs, 10 additional analog audio inputs and 16 outputs, plus lots more. Perhaps most impressive is its super-low latency, which Apogee says can be as little as 1.1 ms, round trip (dependent on your buffer setting, of course). We were glad to have an opportunity to shoot this video on the day the Ensemble came out. Check it out.